One of Jordan’s fabulous occasional sales is run by Geneva’s Daughter, Cindy Nevins. Located in the downtown Historic Hub of Jordan, once Frank Nicolin’s Opera House, the Hub is also home to Carasim Coffee Shop and Antiques, and Thrift Shop. Cindy is fantastic seamstress and master of Repurpose, Recycle, Reuse! And her sales offer you the chance to pick up some of her unique creations – like Cute as a Button little girl dresses made from tableclothes and men’s shirts. And pillows made from vintage linens. And if you have treasured heirloom linens or clothing, Cindy can design a keepsake for you that is sure to impress. Cindy’s creativity does not end at the sewing machine. She offers a line of pampering bath products. And tea cups repurposed as candles. Geneva’s Daughter also offers unique vintage home decor and accessories. With displays changing each sale, and items restocked each day, you just might find that treasure you’ve been searching for – maybe a classic kitchen gadget. Or the perfect garden item…maybe even a plant or two! 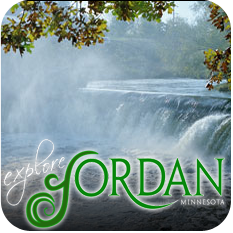 Watch our Jordan Events Calendar for upcoming sales dates. We fell in love with Bed and Breakfasts while honeymooning on Mackinac Island. We fell in love with our mansion while antiquing in Jordan. But it was soap that led us to this chapter in our life at this time in our life. So I’m doing my day gig as a software engineer, but looking for a outlet for my hands-on creative side, and teamed up within another female engineer to learn how to make soap. Then it turns out another fellow engineer was the uncle to the guy who owned that mansion in Jordan we fell in love with. Then it turns out they want to open an arts and crafts gallery in that mansion and heard we made soap. Then it turns out while I’m peddling my soap to them in that mansion that it has everything on our if-we-were-ever-going-to-open-a-bed-and-breakfast-wish-list. Then Kevin comes with me to deliver the soap and tells the owners of our dream. Then it turns out they want to sell that mansion to open their dream winery. So they call us to tell us and here we are. Because of soap. So what is it about soapmaking that is so intriguing? It’s part “Little House on the Prairie,” part earthy-artsy, part mad scientist. And because we have this particular mansion, because of this particular soap, we just had to continue creating soap to share with every one of our guests. So that tradition still continues, almost 8 years later, every bar of soap used in the Nicolin Mansion is made in the Nicolin Mansion. By me. Recently, friends of ours from Nashville/New Orleans (still recovering from Hurricane Katrina) spent an extended stay with us. It was time for soapmaking, so I held my first “Class with the Innkeeper: Soapmaking 101.” And we had a great time making our traditional lye soap. What do you think? Should we start offering a “Class with the Innkeeper” series?